Search Engine Marketing is the process of attracting targeted website visitors organically, in a natural way, and through pay-per-click (PPC) listings. Here’s how Google’s first search results page looks for a popular search term. People at the top of the page have paid Google money to have their websites listed there (notice the little “Ad” boxes near their advertisements). The sites below them show up organically, through search engine optimization (SEO) efforts. 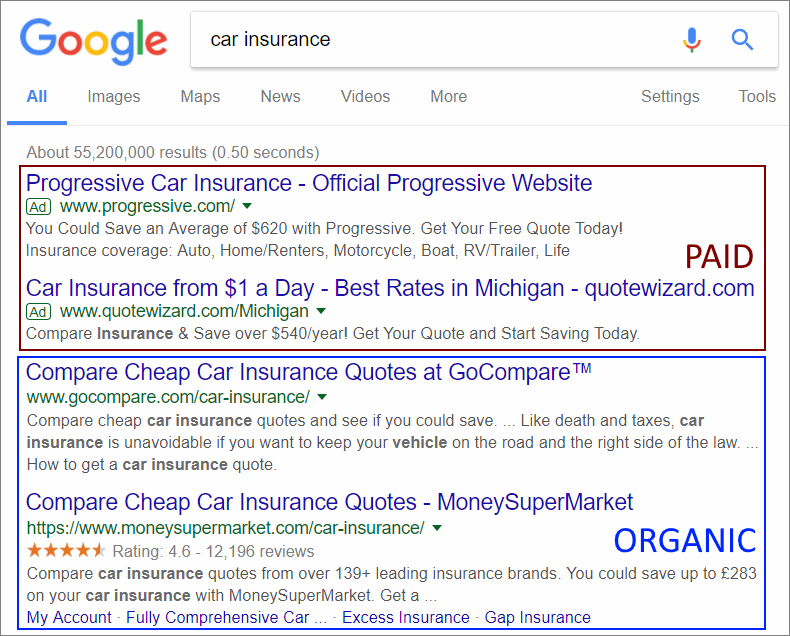 Anyone with a budget can buy ad space, but Google’s organic search results are perceived as being trustworthy. 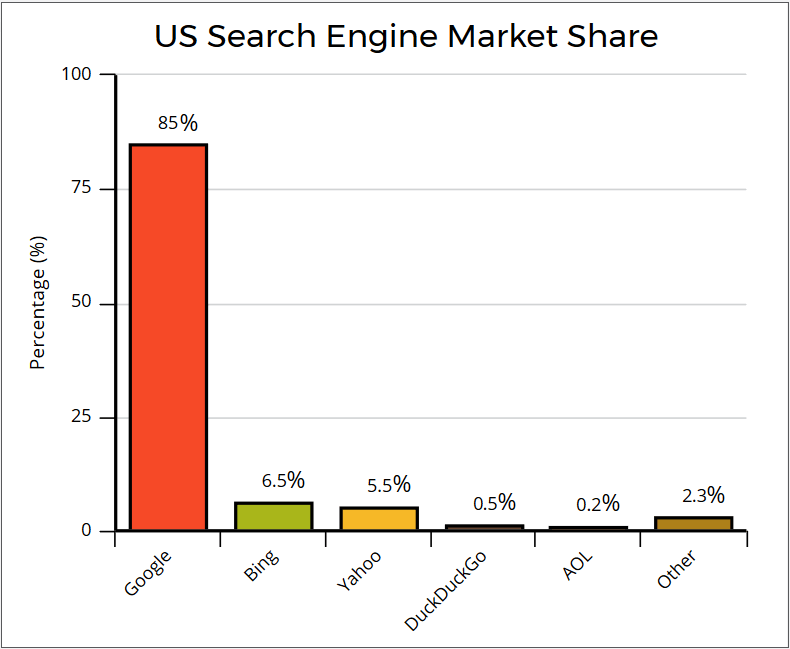 That is why Google dominates the search engine world. People use Google because they trust its organic search results, and not because they want to see its ads. Likewise, people purchase a magazine because they like its high-quality articles, and not because they want to read its advertisements. This doesn’t mean that PPC is bad! In fact, it has got a few unique advantages. According to Google, most businesses earn two dollars for every dollar spent using the Google AdWords platform. PPC helps put your ads on the first page of Google within minutes. And when it is used in conjunction with SEO, it helps your business reach its maximum potential. SEO is the process of creating content, optimizing it for search engines, and then promoting it, with the goal of getting it mentioned by some of the best websites in the world. When those authoritative websites mention your site, they give it a vote of trust which propels it into Google’s top search results. One of my clients has reduced his monthly PPC spend from four digits to only $60. Why did he do that? Because due to my SEO work, he gets a huge number of website visitors for free. Take a look at the Ahrefs report in the image below. 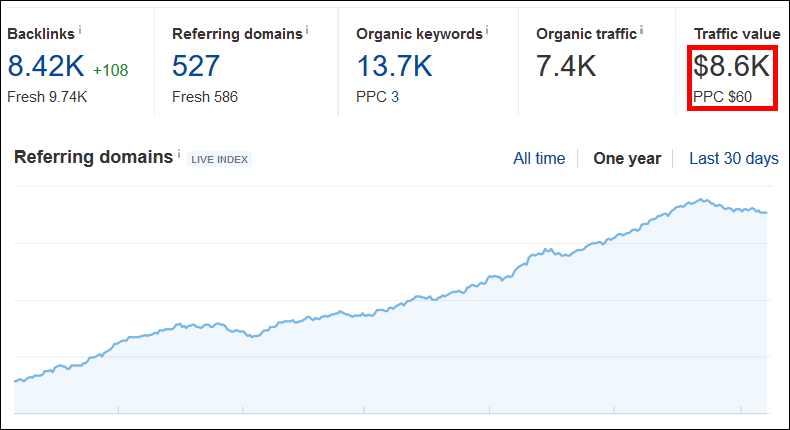 It would cost my client $8.6K per month to get the same number of visitors using Google AdWords. Billions of people use Google to find the best solution to their problems every day. Many of them are searching for your products or services right now, but if your website doesn’t show up on the first Google page, it’s invisible to them. Why don’t you run a Google search using a keyword (a search phrase) that is crucial for your business? Then, take a good look at the ads and examine the organic listings on the first page. These are your top competitors online. And they are here because they use online marketing services to promote their websites through PPC and SEO. Search Engine Marketing is the most efficient way of promoting your business online. It’s a key marketing channel for people who want to grow their business. Search Engine Marketing can take your business to the next level. Contact me to take advantage of this powerful online marketing method.